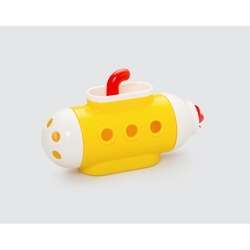 A floating, pouring, spinning submarine for interactive water exploration. Pour the water over the wheel and watch it spin; blow through the periscope to create water bubbles; and use the two sieves to drain the water to create a rainfall. When finished, snap the parts together to reconstruct the colorful submarine.. Product Size: 10.3" × 6.25" × 3.5"